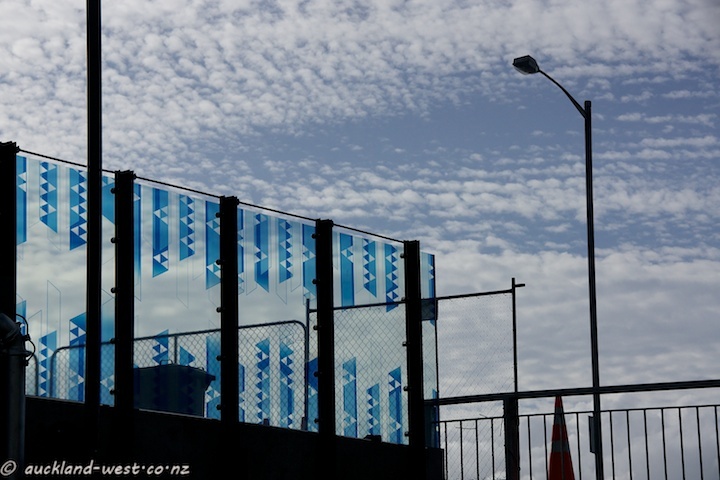 Yesterday’s fence in its full glory. 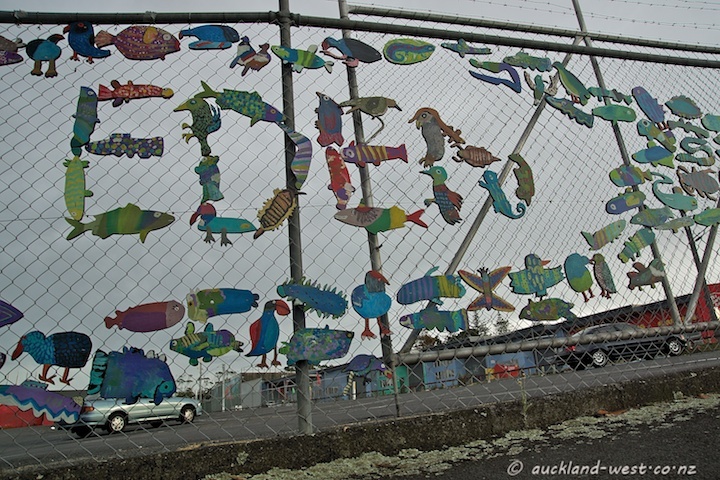 The wire mesh fence around Glen Eden car park is adorned with little painted cutouts of fish and all manner of other creatures, shown here by their shadows on the footpath. 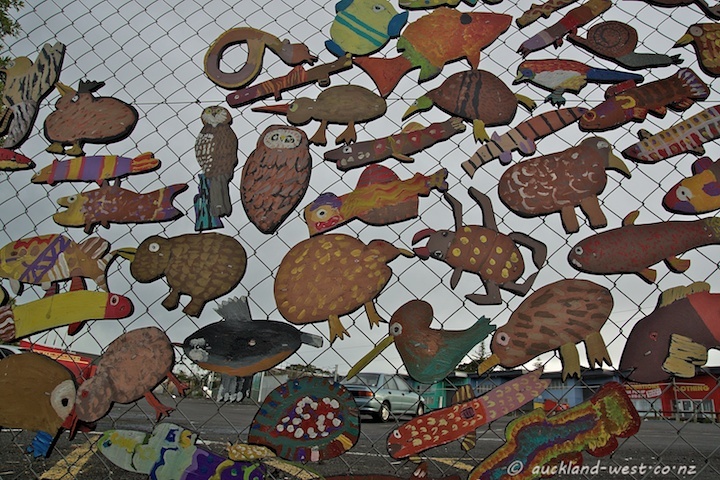 The work is entitled “Nga Taonga o te Waikumete” (Treasures of the Waikumete Stream). 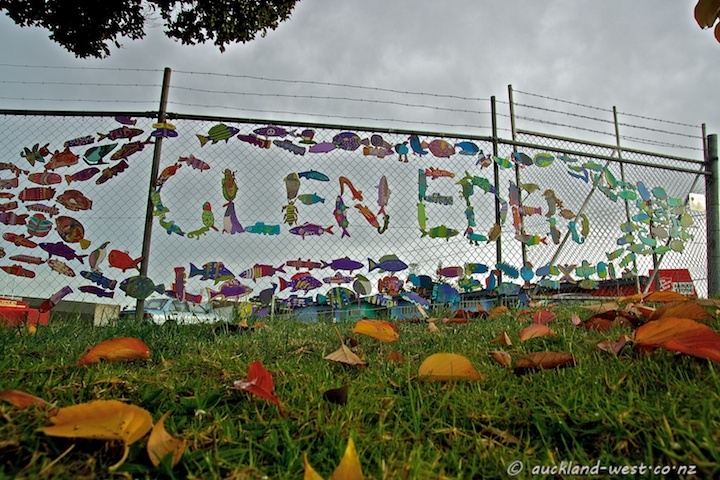 A collaboration of Project Twin Stream Glen Eden, Glen Eden Primary School, Glen Eden Business Association and the local community, celebrating the people, the environment and the natural wonders of Glen Eden. 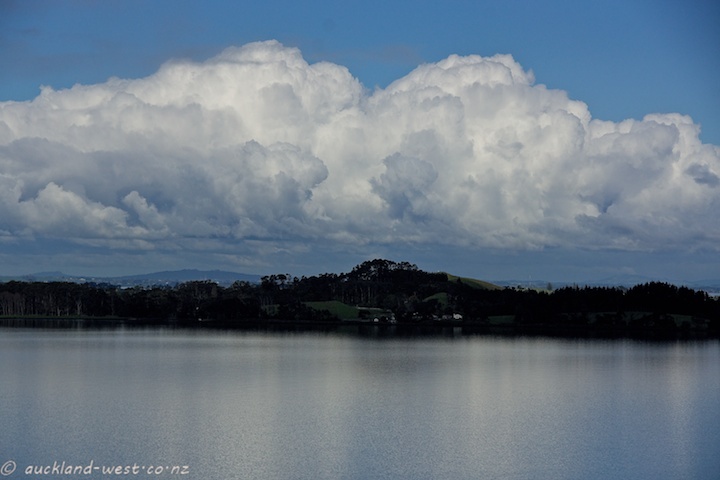 Looking from Waikowhai lookout across the waters of the Manukau Harbour towards Puketutu Island. Before 1913, the New Lynn Post Office was in the Railway Station. When increased rail volumes necessitated a move, local businesses Gardner Bros and Parker (brick makers) built this house and provided it at nominal rental. 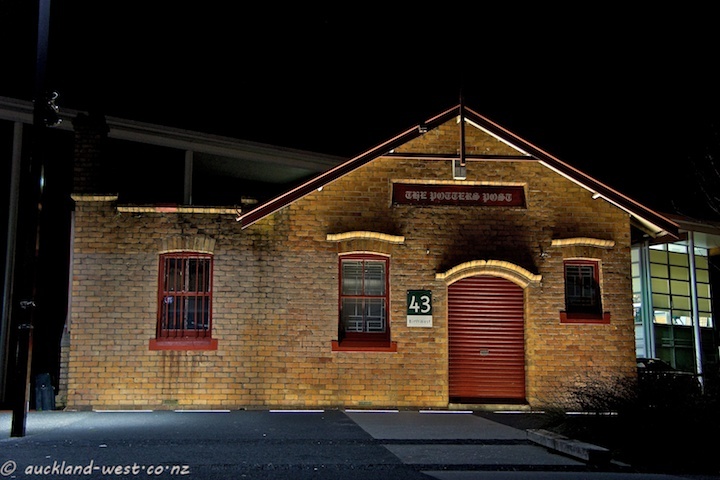 At 43 Totara Ave, it is a heritage building, a reminder of the brick and clay history of the area. 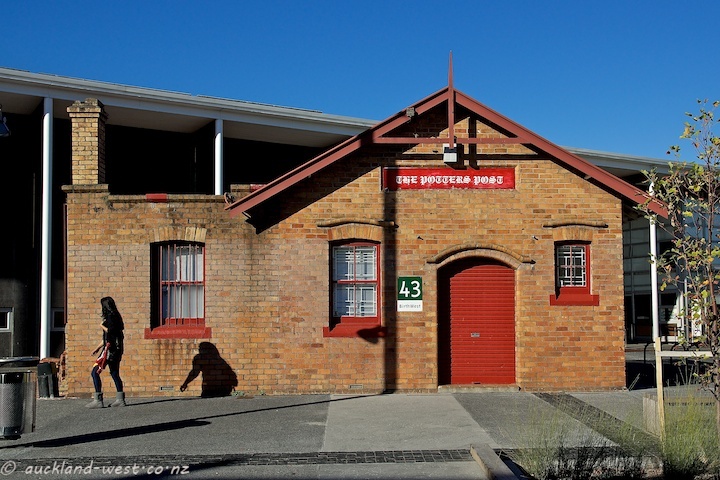 In 1930, a new Post Office was constructed from public funds (now used as the New Lynn Police Station). Presently the building is occupied by BirthWest. Rest assured that we are not in the market for their services :-). Incidentally, the inscription confirms the rule that black letter fonts (Gothic, Fraktur) should never be used in all capitals. 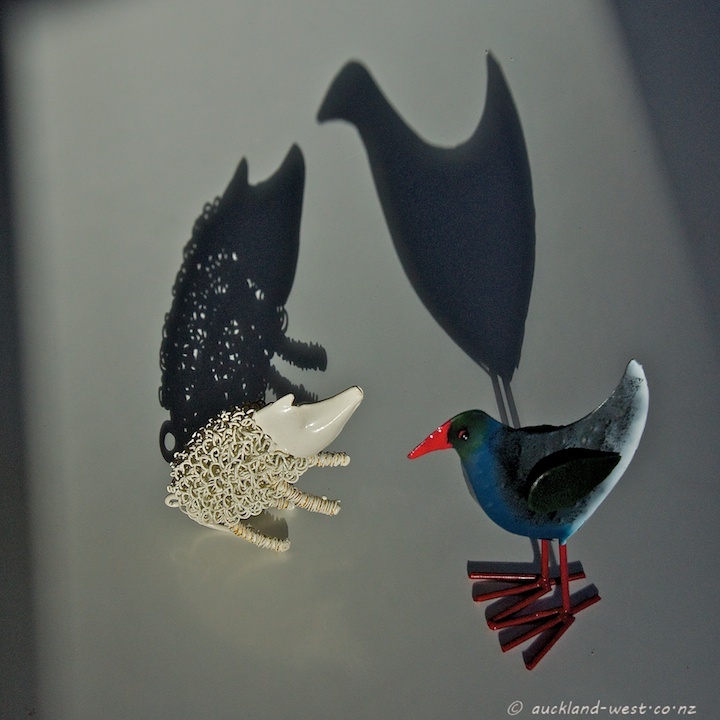 We had just finished afternoon tea last Sunday, when I noticed the long shadows cast by our pet pukeko. As one thing led to another, piglet joined in the fun for a spot of shadow-kissing. 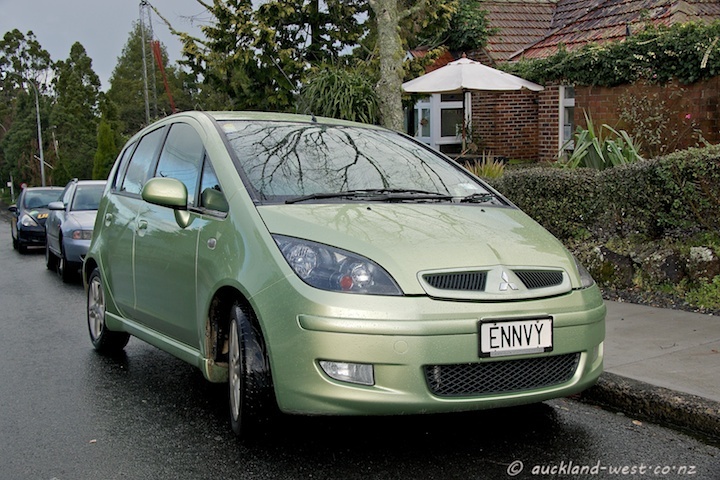 Within minutes the sun was hiding behind the trees, putting an untimely end to the spectacle. 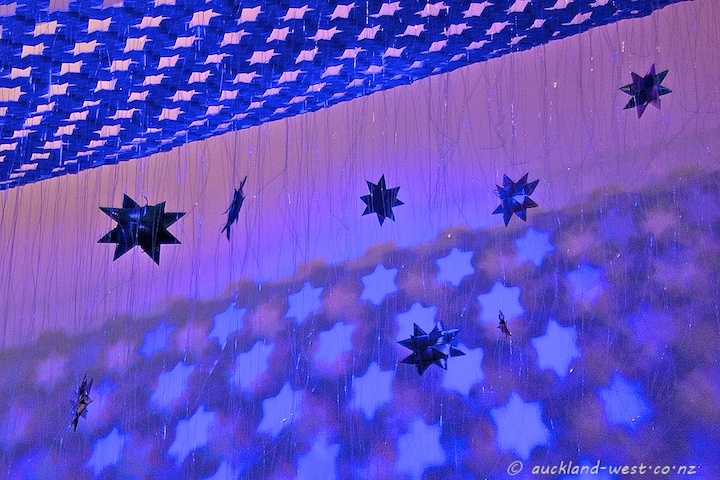 The Matariki Festival (June 22 – July 22) celebrates the Maori New Year as the Matariki constellation (the seven stars of the Pleiades) rise above our horizon. 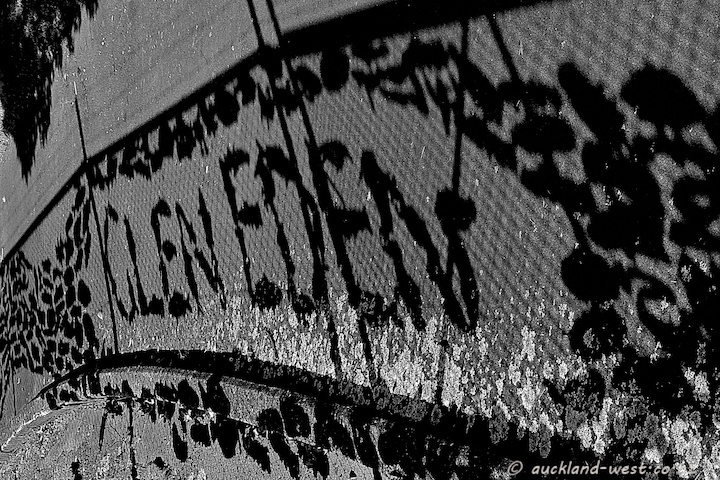 The images are window displays at Lopdell House Gallery in New Lynn entitled Whetu – Whenu – Whenua, combining works by the artists Maureen Lander, Nic Moon, Jacqueline Elley, and Annabelle Buick. 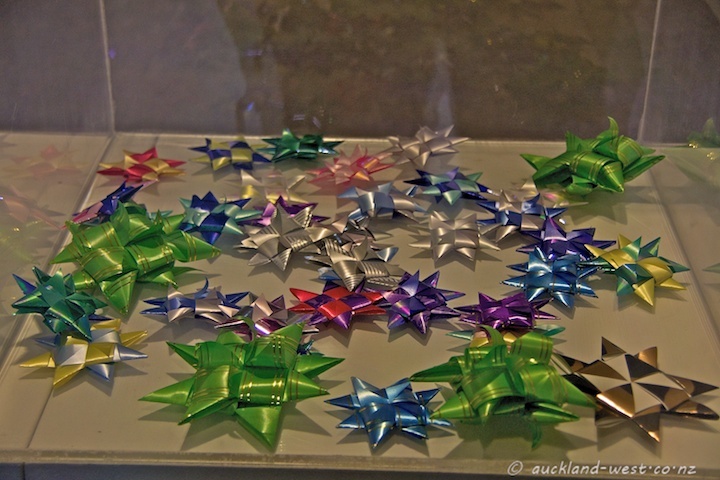 The exhibition runs from June 21 to August 4. 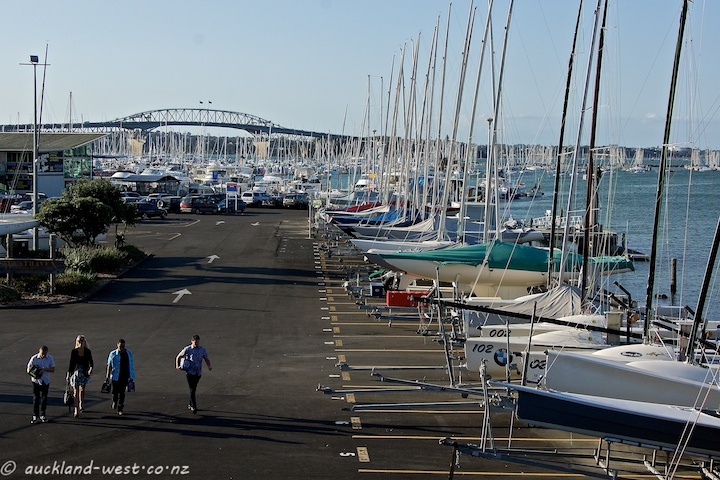 A Forest of masts at Saint Marys Bay, and behind it all the Harbour Bridge. Seen from the Jacobs Ladder bridge. 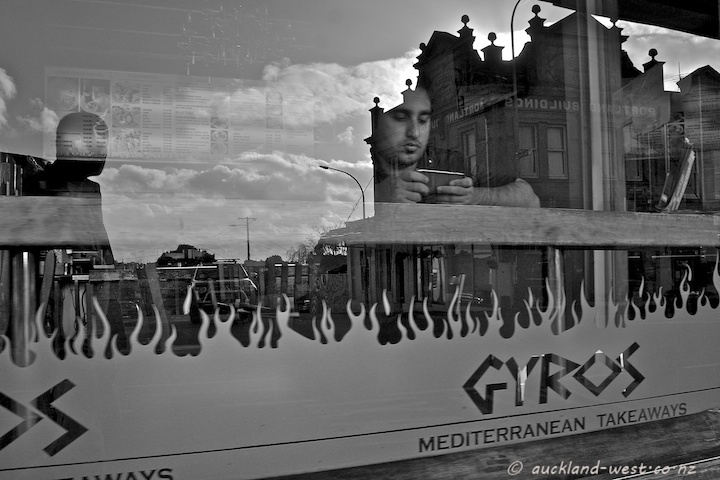 A grab shot as I was passing this Mediterranean Takeaways with the waiting customer. The reflection of the winter sky and of the sharp delineation of the Portland Buildings caught my eye.